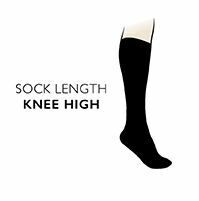 Providing a comfort fit for skiers on easy to varied terrain, and who wear rental boots, these men’s and ladies Thorlos Fully Cushioned Ski Socks ensure maximum warmth, protection, comfort and best fit, and also help skiers prone to blisters, foot pain and discomfort. Thick cushioning features throughout, in the most essential areas, such as the arch, ball and heel of the foot, the shin and instep, for warmth, shear protection and comfort. Developed by the US company, Thorlos exclusive fibres Thor-Lon and Thor-Wick are used in a blended fabric for maximum wicking and warmth. Meanwhile, a ventilation panel in the toe pad (which also incorporates low profile non-irritating toe seams) allows better air circulation.